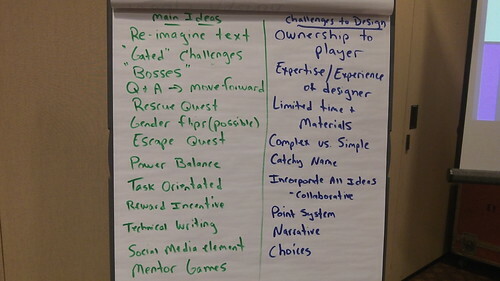 I was a co-presenter at a session at the National Writing Project’s Annual Meeting last week on the topic of game design. I joined Steve Moore, Rafi Santos and Janelle Bence to present a variety of ways that gaming and video games might have a place in the educational setting, starting from a systems framework idea of the ecology of a school, to integrating game design theory into the curriculum, to connections to the Common Core, to how to build a game. It was a lot of fun, and full of interesting insights by the participants, who spent a chunk of time collaboratively constructing a game and then reflecting on the experience. You can also access the agenda online, which has resources that the presenters and the audience have pulled together. Let me first admit: I certainly know of the Khan Academy but I have never actually visited it or viewed any of the videos. I’ve followed some of the ways that Salman Khan’s video tutorials have sparked the Flipped Classroom concept, and some of the controversy that comes with both the academy and the flipped idea. But I am relatively outside of the loop on Khan. I offer up those words because I spent the plane ride back from Las Vegas devouring Salman Khan’s book about educational change, The One World Schoolhouse (Education Reimagined) , and found it very intriguing. Now, I am one of those teachers who are part of what Khan sees as a problem. I teach in a traditional school, with one-hour blocks, where curriculum is often (but not always) built on time more than student mastery, and I have classes composed of students in age groups instead of mixed (he is against tracking and is passionate about how tracking students into honors and lower classes traps students, particularly in math). But I am open to change. building fun and play into the curriculum so that topics like math don’t become rote learning that never really gets learned. I think The One World Schoolhouse is worth your time and worth a read. Even if you have preconceptions of the Khan Academy concept (and more schools are now partnering with his organization to pilot the use of video tutorials and computer assessments), the book at least centers where Khan is coming from, and it encourages you to re-examine the “why” of our school system, which is built around a framework that Khan argues was constructed by chance and politics, and not necessarily the best interests in young learners. The lady next to me looked at me very odd as I was creating a comic. Bet she doesn’t see that much in HER classroom. I spend a long, but amazing, day at the NCTE Convention yesterday, tweeting about my experiences as much as possible. Instead of re-writing those, I have toyed around with Storify to collect and assemble my tweets in the sessions. You’ll see that much of my focus was on digital composition. This is a comic as part of my exploration of digital media with other folks taking part in Digital Writing Month. 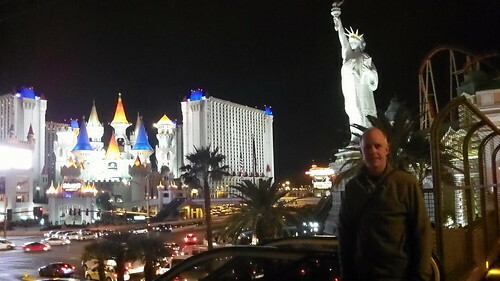 I’ll be sharing pieces of my experiences here in Las Vegas at the National Writing Project Annual Meeting over the coming days (today, it is on to NCTE). 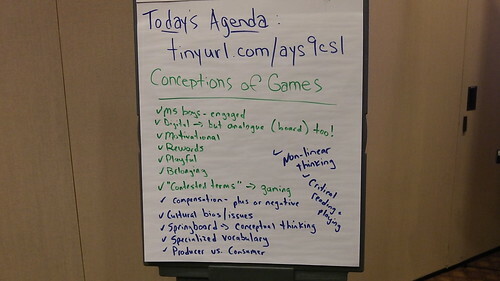 I attended a number of very interesting sessions yesterday, and co-presented one around game design. I also joined 600 NWP colleagues in the main plenary sessions where we wrote (naturally) and got inspired by some terrific speakers. What stuck out for me over the course of a very full day, however, was something rather surprising and for me, unexpected. I was reminded once again about the power of the narrative. I say surprising because the shift to the Common Core has reduced how narrative writing might figure in our classrooms, in favor of informational, expository and argumentative writing. But, starting in the first session I attended around Systems Design and Digital Writing, I realized that so much of this theory around elements shaping outcome, and how the parts define the whole, and how one twist in an element can potential alter the system is pretty close to what we do when we write a story. We add a character, toss in a plot twist, design a story through its parts for a larger meaning. It’s really a narrative understanding of the world. And the keynote speakers at the big session — Jeff Wilhelm, Michael W. Smith, and Jim Fredricksen — have written three books centered on some main elements of the Common Core, but all three spoke passionately about the ways that narratives inform our lives, and provide a framework (again, a system) for understanding. So, when Wilhelm was talking about how making lists for informational text and understanding is one way of organizing our understanding, he also noted how we use narrative to put those lists in order in a meaningful way. The other two speakers touched on narrative, too. And then, in both our gaming session (where narrative is the design backbone of my game design project, but with a science theme), and in a last session around tools that allow you to compose/hack the web, we talked again about how story and narrative are an essential thinking framework. All this is heartening. I know the Common Core doesn’t remove narrative, but it does minimize it, and that worries me as a teacher and a writer. If we can find more ways to weave those strands together, of remixing narrative in the scope of informational/expository writing, so that writers have more options, then we are providing an interesting road ahead for our students. Digital Writing Month Comic: It’s All in November! It took me a minute to realize that she was creating a space for girls and a space for boys, and the symbols represented stereotypes of the gender (tiaras and dancing shoes for the girls, for example, and a game system and a football for the boys.) I used the opportunity to talk to her about stereotypes, but she just shook me off, and continued her journey around the room, polling kids on what symbols should be where on her map to represent boys and girls. I’ll be revisiting that issue later, maybe as a whole class discussions. So, this morning, I was pleased to see this: CommonSense Media just released what looks like an interesting set of free lesson plans and resources built around gender identity and stereotypes related to the digital world, particularly around media and advertising. I do some of this during our Digital Life unit, but not enough. I’m going to use some of the ideas here to strengthen those discussions this year. It’s worth a look. I’ll be digging into it. Our class did the most online searches last month with InstaGrok — a web-based too for gathering data and making sense of it — and the site featured our classroom. They asked if I might be willing to answer a few questions about how we use InstaGrok for our research projects. I did, and it gave me a chance to do a little reflecting on the things and approaches we were doing.